I spent most evenings over the past week digging through the stacks of seed catalogs that have been arriving at my house since Thanksgiving. While I probably get more catalogs than most gardeners, it struck me how daunting it is to decide what to grow, if you are a beginning vegetable gardener. So — as a gardener who has watched lots of plants die or just sit there — here are some suggestions of sure-fire, almost-no-fail vegetables to plant. There’s nothing as fun as tomato time in the garden. Tomatoes. Nothing, but nothing in the store is as nice as a fresh tomato from your own garden. The best bets for the north are the cherry types (can’t beat Sweet 100s for reliability) or any of the pear tomatoes. 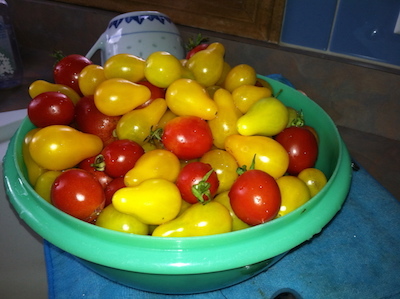 I had great luck with Beam’s pear last year and am trying a mix of red and yellow pear tomatoes this year. A totally reliable slicing tomato is Celebrity. It’s an All-American Selection winner from 1984, is widely available as a seedling, resists most diseases, and performs well even in somewhat poor conditions. If you want to make tomato sauce or salsa, try ‘Roma.’ I’m going to grow ‘San Marzano‘ this year, which I’ve heard is very reliable as well. Newbie gardeners should buy starts (little tomato plants) rather than trying to start tomatoes, peppers and other warm-season crops from seed. Tomatoes need warm soil — something we don’t have in Minnesota until about June — and it’s a hassle to start seeds inside (it’s fun, but a hassle), so go to a local nursery or the farmers’ market and buy plant starts there. The farmer or nursery employee will be able to offer advice, too, on when and where to plant the seedlings. 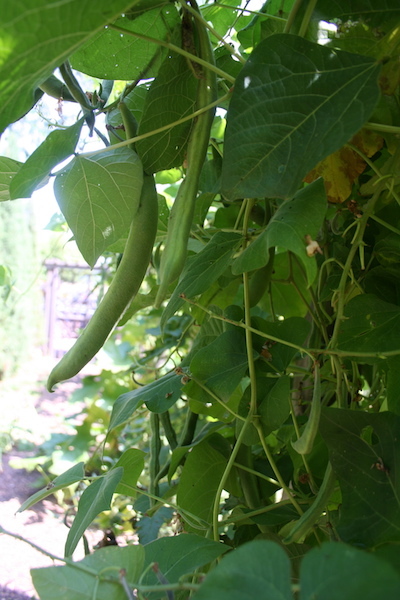 Pole beans produce a longer harvest than bush beans. Green beans. Another easy plant to grow. Get a bush variety so you don’t have to hassle with setting up a trellis or pole tepee. Some of the most reliable are Provider or French Filet. If you want to grow pole beans because they require less space, try Blue Lake or Kentucky Wonder. Like tomatoes, beans do not like cold soil. Wait until it’s getting warm before you plant them, and keep an eye out for bunnies. My beans were nibbled to the nubs last year by rabbits. This year, I’m putting a wire fence around the bean bed. Zucchini. Zucchini is so sure fire, I almost hate to mention it. Plant this summer squash (any variety will do) and you’ll soon be leaving grocery bags of it on unsuspecting neighbor’s porches. Lettuce. Seed providers have really gone crazy with lettuce mixes, so try one. I’m planting ‘Farmer’s Market Blend‘ from Renee’s Garden, but there are dozens of options. Lettuce can be planted early, just keep it moist and don’t plant it all at once. You want to plant every couple of weeks in the spring, then take a break, and plant again in August for a fall crop. 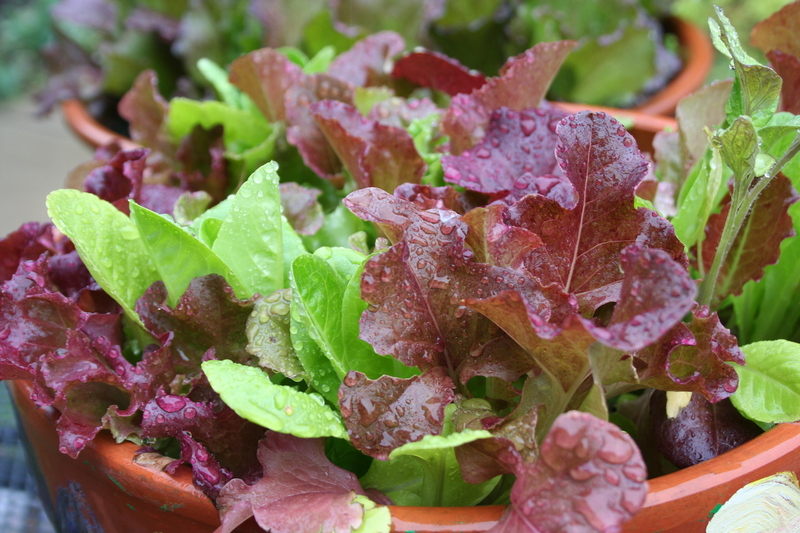 Leaf lettuce is great in spring and again in fall. Raspberries. If you have room, and you want big gratification for little effort, plant raspberries. A trellis will keep them neat, but raspberries are a bramble — which is a close cousin to a weed — so plant a few bare-roots and watch them produce. I grow ‘Anne‘ and ‘Caroline’ and love them, but there are many good varieties for the north. 2018 Update: The increase in spotted wing drosophila in Minnesota has made raspberries an iffy pick. If the SWD is in your area, avoid raspberries. Those would be my picks for a first garden. What would other gardeners plant if they were planting their first vegetable garden? I have always had good luck with cucumbers, and they are very satisfying to pick and slice right up into a salad. I have usually provided them with some kind of trellis so they can grow up, rather than sprawl over the ground, but you can do either (if sprawling, put some straw under the fruits to keep them off the ground for the least likelihood of rotting or insect damage). There are some delicious varieties for home growing, and they often have a tenderer skin than those you buy at the supermarket. For me it comes down to what you like to eat, and how much space you have. Even if you’re limited to planting in containers, you can have great success with peppers-both sweet and hot types. Many varieties start producing early and will continue right up until the frost. The plants are compact, and don’t generally need to be staked or supported. We like to dry the final harvests of the hot kinds in a dehydrator for use in cooking all winter. I have a question about zucchini. Last year was my first garden and I planted a few zucchini plants because I had always heard they were easy and prolific. Well, although the plants grew and flowered, I did not get a single zucchini! Not one! Is there something I should have done? I’m no zucchini expert, but there could be a couple of reasons for this. There are boy and girl flowers on zucchini and they need to get together to produce fruit. Usually, bees do the job. It may be you don’t have many bees around or for some reason your plants produced only male or female flowers (odd, but possible, I suppose). The U of Minnesota extension site mentions a disease that can also lead to a lack of fruit or fruit that shrivels. Anyone else have ideas on what could be going on here? Yes, I think I did have only boy flowers on my zucchini, I had read that and looked at the flowers. I had only planted a couple of seedlings from the store, so this year I have ordered a whole packet of seeds to plant, so I would certainly hope I end up with both boys & girls! We do have plenty of bees that hang out in our yard. But of course, they need boys and girls to do the job. My first garden was last year and I had good luck with green peppers, although the tags are out in the garage, I don’t know what the variety was. I also had green beans. Tomatoes did not do well at all, but I have heard that was a problem in many gardens last summer. I also had yellow summer squash and cucumbers. Whatever you do, don’t plant peppermint! It easily grows…and grows and grows and generally takes over the bed and more. I suggest putting it in a pot away from everything else. Sounds like your first garden went pretty well. Tomatoes were a problem all over Minnesota. As for the mints, I learned that lesson about 15 years ago when I made the mistake of planting oregano in the garden. I am sure the owners of my old house are still pulling seedlings every year. A couple of times when I don’t see fruit developing I’ve played the role of the bee with the zucchini or cucumbers by taking one of my kids’ little paintbox brushes and going from one flower to another and very gently touching the inside of each. I’m starting my first vegetable/herb garden this year and to tell you the truth I’m a bit clueless. I’d love to do potatoes, carrots, tomato, cucumber, cabbage and a few herbs. Can anyone give me some advice on what does well in the metro area of Minnesota? (I tend to lean towards heirloom veggies and like ones that have some history or stories behind them.) Also, I’m doing the victory garden as a raised platform… I’ve heard this is better. What do you think? Any advice that anyone can give would be greatly appreciated!!!! Bre; Sorry for being so tardy in responding to your comment. You are one of several newer gardeners that I’m hearing from. Here’s a quick answer to your questions: Raised beds–yes or no. Definitely yes. They are easy to build (I’m a dud with a hammer and have built several.) They keep the soil warmer in the spring, are easier to keep weeds and critters out of, and can be covered easily for a frosty night. Yes, yes, yes to the raised beds. What to plant? That is hard to say because it depends on what you like. If you want heirloom seeds, I would check out Baker Creek Seeds (www.rareseeds.com) or the Botancial Interest site I link to from the blog. For a first garden, though, I would suggest you buy tomatoes and cucumbers as plants. Go to a local, independent nursery and ask the help what they recommend. There are many very knowledgeable gardeners working in those nurseries (not the big boxes). The most important thing to do for your new garden is put it in the sun. Veggies need full-sun –six or more hours a day, preferably in the middle of the day. I’ll be posting more on veggies as the season progresses. One guiding principle for a small garden, is don’t waste space on veggies that can be purchased cheaply, like corn, cabbage and potatoes. That cabbage is going to take a season to grow and use up precious space. You can buy one for a buck at the farmer’s market. I would emphasize salad greens, herbs, green beans – stuff that you are likely to use daily and can plant in succession. And note that while heirloom tomotoes are delicious, they are also prone to various diseases. If you have limited space, stick with a few hybrids. Another tip is to draw a map of your garden to use as a guide for plant rotation the following year – less disease problems that way. Great advice, JB. I’ve never grown corn, cabbage or potatoes. If you have the space, I like raspberries, which are super easy to grow and expensive even at the farmers’ market. I have a question about planting onions, cilantro and sweet peas in our sandy soil here in Becker, MN. We plan to do top soil, of course, but wondering what we can do to ensure a good crop of the above, as well as raspberries (probably not a problem), tomatoes, peppers, beans, cucumbers, and a couple of other herbs. (oh; and lettuce). 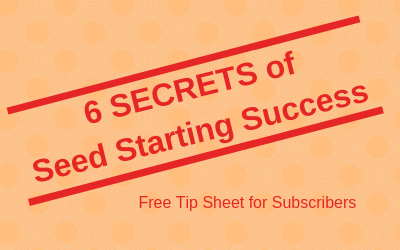 I’ve read up on the advice here, so I’m going to follow it; just wanted advice on what works best with onions, cilantro and sweet peas, as well as how to best prepare a vegetable bed.